Recipes to Make Fresh Strawberry Squash .Hmm this afternoon hot. What should we do? Hmmm certainly need freshness. Hmm what is it fresh? 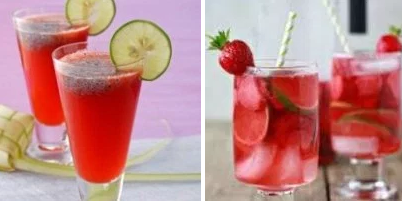 Well we've got the recipe drinks fresh highly suited for you accompany your break time is We share only for those of you who want to learn to make this refreshing drink. With many choices of fresh drinks available and we can easily buy them in supermarkets or taverns are available according to our wishes. And also in a large cafe cafe was the drink is already known because the drink is very tasty and fresh. But maybe you want to make your own favorite beverage in ruman but you do not know where to begin? quiet, this time you are able to make your own with ease. Go see the ordinance making well below. Blender strawberries, lemon juice, strawberry syrup, sugar and crushed ice until smooth. Serve with mint and lemon slices and fresh soda water. 0 Komentar Untuk "Recipes to Make Fresh Strawberry Squash"